The Glenvar Community Plan was adopted by the Board of Supervisors on January 24, 2012, to study development and redevelopment issues along West Main Street and in the Dixie Caverns area, in anticipation of the widening of West Main Street and the proposed intermodal facility in Montgomery County, and to ensure that future development is consistent with the Glenvar Community's vision. The Glenvar Planning Area stretches west to east from the Montgomery County border to the City of Salem, and north to south from Fort Lewis Mountain to Poor Mountain. The Planning Area measures 31,744 acres in size and encompasses all or portions of 5,081 parcels. 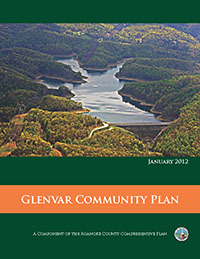 View a map of the Glenvar Community Plan Study Area. For additional information on the Glenvar Community Plan, please contact Philip Thompson, Deputy Director of Planning at (540) 772-2029, or Megan Cronise, Principal Planner at (540) 772-2106.